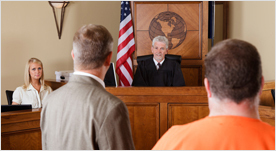 If you have been arrested, tell the authorities you want to contact your attorney immediately! If you have been arrested in Manhattan, Queens, Brooklyn, Bronx, Suffolk & Nassau Counties on Long Island, Westchester County, Rockland County, Orange County or anywhere in New York State, don't be frightened, contact The Law Offices of Sheldon Leibenstern as soon as possible. If you are arrested, besides identifying yourself and requesting your attorney, you must REMAIN SILENT! Other than identifying yourself do NOT answer any questions asked by the police or any other law enforcement agent. Be polite and simply state "I want to call my lawyer." and contact The Law Offices of Sheldon Leibenstern as soon as possible. Police officers are trained to gather evidence to build a case against you. While gathering evidence, rules and laws are often bent and statements are taken out of context in the interest of an arrest and a rapid conviction. Many individuals get themselves convicted by making verbal statements and/or confessions to the police. Any cooperation with law enforcement should not be done without your attorney present. The Law Offices of Sheldon Leibenstern is available to you 24/7.